An article in the journal Science says other countries may view the Insect Allies program, which hopes to deploy bugs to make plants more resilient, as hostile. A research arm of the U.S. military is exploring the possibility of deploying insects to make plants more resilient by altering their genes. Some experts say the work may be seen as a potential biological weapon. In an opinion paper published Thursday in the journal Science, the authors say the U.S. needs to provide greater justification for the peacetime purpose of its Insect Allies project to avoid being perceived as hostile to other countries. Other experts expressed ethical and security concerns with the research, which seeks to transmit protective traits to crops already growing in the field. Biodefense is an easy win. So why are we losing? The insect deployment would mark a departure from the current widely used procedure of genetically modifying seeds for crops such as corn and soy, before they grow into plants. The Defense Advanced Research Projects Agency, an arm of the U.S. Department of Defense, says its goal is to protect the nation's food supply from threats like drought, crop disease and bioterrorism by using insects to infect plants with viruses that protect against such dangers. "Food security is national security," said Blake Bextine, who heads the 2-year-old project. The State Department said the project is for peaceful purposes and does not violate the Biological Weapons Convention. The U.S. Department of Agriculture said its scientists are part of the research, which is being conducted in contained labs. The technology could work in different ways. 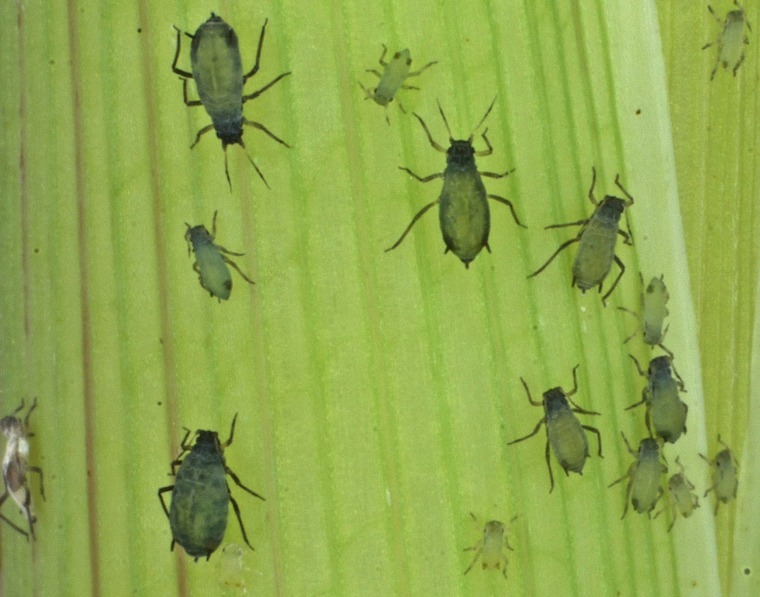 In the first phase, aphids — tiny bugs that feed by sucking sap from plants — infected plants with a virus that temporarily brought about a trait. But researchers are also trying to see if viruses can alter the plant's genes themselves to be resistant to dangers throughout the plant's life. Still, the research is raising concerns. "They're talking about massive release of genetic modification by means of insects," said Gregory Kaebnick, an ethicist at the Hastings Center bioethics research institute in Garrison, New York, who has studied genetic modification. He wasn't part of the team that wrote the Science paper but said Insect Allies technology could end up being destructive. Kaebnick questioned how well the viruses and insects carrying them could be controlled. "When you are talking about very small things — insects and microbes — it might be impossible to remove them" once they are introduced into farmers' fields, he said. Dr. David Relman, a professor of medicine and microbiology at Stanford who advised the Obama administration on biodefense but is not part of the DARPA research, said the project could play into countries' longstanding fears that enemies would try to harm their crops. Still, Relman said, the technology could potentially help farmers fight a "bad plant virus moving across the plains" or protect crops from bioterrorism. Since insects often spread crop diseases, Relman said DARPA is trying to use the bugs' own biology to "recruit them as allies" in spreading protective traits. Though it's not a household name, DARPA helped develop the internet, and its mission is to research potentially pivotal new technologies. The agency announced the Insect Allies project in 2016. Guy Reeves, a co-author of the Science paper and a biologist at the Max Planck Institute for Evolutionary Biology in Germany, says the technology is more feasible as a weapon — to kill plants — than as an agricultural tool. As a result, he said, DARPA could be sending an alarming message regardless of its intentions. "It's really about how it's perceived," he said. The papers' European authors say the mere announcement of the program may have motivated other countries to develop their own capabilities in the arena. They say the project also underscores the need for greater discussion of the regulatory and ethical concerns of such developing technologies. Todd Kuiken, a senior research scholar at North Carolina State University, said he doesn't think the military intends to attack another country with insects. But he said it looks bad that DARPA is funding the project. "The pure fact that this is a military program would naturally raise these sorts of questions," said Kuiken, who last year raised concerns similar to those published in Science. Tom Inglesby, a professor of environmental health and engineering at Johns Hopkins, said the technology is being developed specifically to protect crops. But he acknowledged that it could be misused. Concerns that a new technology could be weaponized are to be expected, even if that's not the intention, said Paul Thompson, a professor of agriculture and ethics at Michigan State University who is on an advisory board for DARPA. "Once you make those kinds of breakthroughs, you are in a new world. It's a morally ambiguous place. You wonder, 'Is this something that we should never do?' "